Own the dance movement before you put it on stage. You can do this by creating a skeleton choreography that will help keep your routines fresh, and it will keep you from over-choreographing. Allow some surprises not only for the audience, but also for yourself. It is not necessary to do exactly what is taught in the choreography section of this DVD. This program was designed to give you tips and ideas to put towards your dance. This is not a DVD to be followed blindly and nor do we expect you to perform exactly everything that is presented. You should be free to choose the dance moves that speak clearly to you as a belly dance performer. At the end of this DVD, you can see 4 dancers with four different approaches, performing to the same song that was taught early on. Some will follow the choreography very closely and some will have a more loose structure of the choreography, only choosing one or two moves that best compliments their dance style... whether it be fun, joyful, demure, or sultry. Liked this a lot and I loved Lotus Niraja! She has a great persona and teaches the material well. Fun Dvd to work with. Gives lots of tips and tools on how to create an interesting dance performance. She teaches a choreogprahy and shows you the details of how to make it own the stage. Also covers dramatic entrances and exits. This dvd is great! I will purchase any future dvds that she puts out. She is amazing. 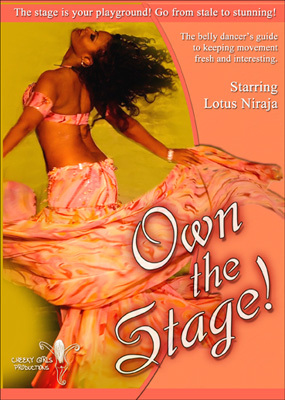 Lotus Niraja’s DVD, “Own the Stage” is by far the best DVD I’ve seen in a while. Her teaching style is exactly what I was looking for. She has a very gentle tone and I love the way she presents her instruction so that you learn a routine. A plus was having other dancers, (with their unique styles) present the same routine adding their own individual twists. This DVD kept my interest, I found myself not pausing it to do other things, or feeling that, “It’s just too hard, I could never do that!” I’m very pleased and I’m currently searching for more of her DVD’s.